Regular activities: Yoga varga- 26 people, Swadhaya varga-14 peole- topic Sadhana of Service. Bhajana every Saturday. 621 first grade college students from Govt College K R Nagra, Govt Arts College , Hassan and AVK College, Hassan wrote examination on Life and Message of Swami Vivekananda. 10 days personality development camp held from 3rd April to 12th April 2014. Yoga , patriotic songs, bhajan, talks on great people, group discussion, games, story telling etc are the main events in camp. Sri C V Gopinathji, Retd. Additional secretary , Govt of India, Dr A S Cgandrashekar, President V K Mysore, Smt Padma took boudhik session. 43 students participated in camp. 10 Days Sanskrit sambhasahana shibir held from 25th April to 4th May 2014. 12 students attended the shibir. 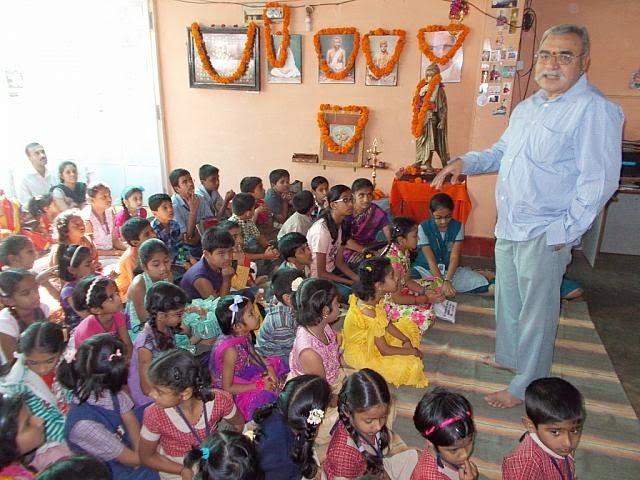 Col. Kumarswamiji, Sanskrit bharati mysore took class. On 25th May 2014, one day Kendra parichaya shibir organized at Mysore. 16 people from Mysore city attended the shibir. Yoga, samskara and Swadhaya varg, Bhajan, games conducted for participants. Dr. A S Chandrashekar talked on Rock memorial and Ma, Eknathji. Powerpoint presentation on Rock memorial construction and Kendra activities shown to participants. Labels: activity report, APRIL-MAY:2014 MYSORE.